Hello and welcome to the 494th installment of the SWD. Vehicle-borne improvised explosive device targeted a post office in the village of Bab Limoun near Al-Rai in northern Aleppo. The post office is/was used by the Free Syrian Army’s Liwa Ahfad al-Fatiheen as headquarters. According to the reports, at least six civilians were killed and a dozen wounded by the explosion. Similarly, a vehicle-borne improvised explosive device targeted the building of Akhtarin’s local council in Akhtarin, reportedly killing one and wounding more than 20 civilians. Our forces carried out on July 22, 2018 an operation against Reconnaissance Group’s commander of Fileq al-Sham mercenaries, Mohammed Ali who called “Abu Dojana” who is from Latakia province of Syria. The operation which carried out when the mercenary Mohammed Ali was driving his car on the road between Midan Ekbes and Qera Baba villages related to Rajo area of Afrin canton. Hayat Tahrir al-Sham reportedly ambushed and killed Islamic State’s leader for Al-Dana region, Ismail Abdel Qader (Abu Hassan al-Nairbi) on a road near the village of Qah. Separately, a Hayat Tahrir al-Sham’s element was ambushed and killed by unknown gunmen in the village of Kafr Sajna. Improvised explosive device targeted a Jabhat Tahrir Suriya’s vehicle on the road between Ariha and Al-Mastouma, reportedly killing four elements of the group. The elements were arriving in the area in order to dismantle improvised explosive devices. 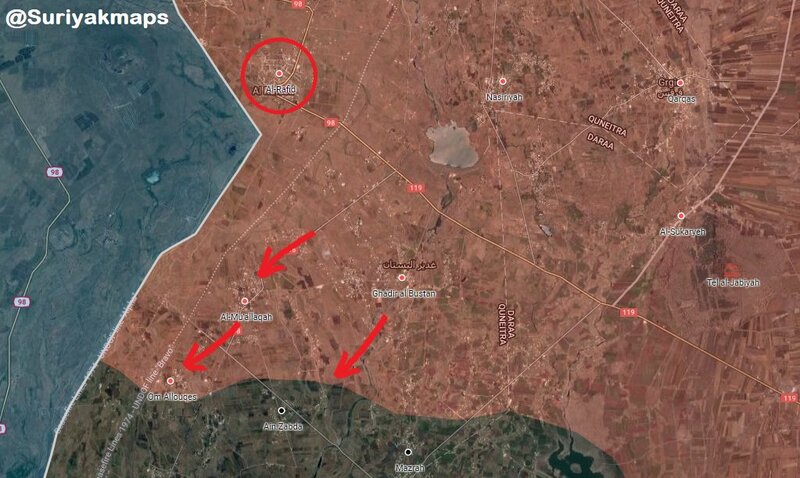 Syrian Arab Army and allies fully secured Ghadir al-Bustan, as well as captured Al-Muallaqah and Umm al-Luqas from the Islamic State-affiliated Jaysh Khalid ibn al-Walid. Syrian Arab Army also entered the village of Al-Rafid. Islamic Emirate of Afghanistan’s (Taliban) sniper assassinated Afghan National Army’s commander, Leal Chonta in Chardara district. Afghan National Security Forces killed two elements of Tehrik-i-Taliban Pakistan in Marawara district. Afghan National Security Forces killed 20 elements of the Islamic State in Ghani Khel, Khogyani, Achin, and Dur Baba districts. Islamic Emirate of Afghanistan’s improvised explosive device destroyed an Afghan National Army’s vehicle, killing two and wounding one soldier in Wazir area of Khogyani district. Islamic Emirate of Afghanistan overran an Afghan National Police’s post in Maqbalo Tangi area of Patan district. Five elements of the Afghan National Police were killed and 15 wounded, while an element of the Islamic Emirate of Afghanistan was killed in the encounter. Islamic Emirate of Afghanistan seized four assault rifles and two RPG launchers from the post. Afghan National Security Forces arrested five elements of the Islamic Emirate of Afghanistan and seized 13 motorcycles in Dulayna district. Islamic Emirate of Afghanistan overran four Afghan National Security Forces’ checkpoints and five military centers in Kakhor area of Gizab district. Reports suggest that 14 elements of the Afghan National Security Forces were killed, three wounded, and two arrested in the encounters. Islamic Emirate of Afghanistan overran three Afghan National Police’s posts in Piera and Qyagh Dara areas of Jaghatu district. At least two elements of the Afghan National Police were killed in the encounters. Islamic Emirate of Afghanistan attacked an Afghan National Army’s convoy in Mani Kando area of Gayan district. Afghan National Army’s commander Harand and four other elements of the army were killed, while seven elements were wounded, as well as two vehicles destroyed in the attack. The convoy is reportedly still under Islamic Emirate of Afghanistan’s siege. Islamic Emirate of Afghanistan’s Al-Emarah News stated that the group overran Atghar district’s administration center and a military base, while nearby headquarters of the ‘National Directorate of Security’ are still under the group’s attacks. Al-Emarah News stated that 23 elements of the Afghan National Security Forces were killed in the encounters. Afghan National Security Forces arrested 15 elements of the Islamic Emirate of Afghanistan and destroyed a vehicle in Nawa-I-Barakzayi district. Between the 16th and the 22nd of July 2018 CJTF-OIR has conducted 21 strikes in Syria. CJTF-OIR‘s main focus in Syria at the moment is Deir al-Zour-Albu Kamal region where they did 19 strikes supporting SDF‘s operations against IS destroying seven IS vehicles, four IS supply routes, an IS-held building, six IS lines of communication, and two IS logistics hubs. Other area where two strikes occurred is Al-Sour, destroying two IS motorcycles. Full report on CJTF-OIR strikes conducted in both Syria & Iraq can be found here.